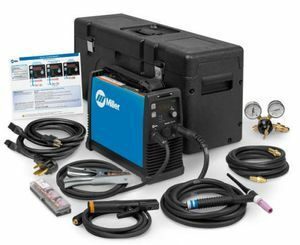 Miller Maxstar® 161 STL TIG/Stick welder package comes complete with 150 amp TIG torch, TIG accessories, flow gauge regulator, gas hose, stick electrode holder, power cables and X-CASE. It is capable of up to 160 amps of DC welding output. It weighs only 13 pounds and operates on either 120 volt or 240 input power. 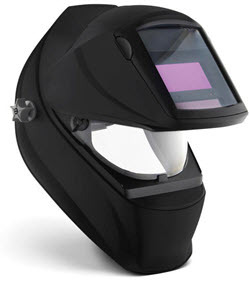 The Maxstar 161 STL features Miller's Lift-Arc™, which initiates the TIG welding arc without using high frequency. The TIG arc is struck when the tungsten electrode is lifted off of the weld piece. Auto-Line™ - Allows for any input voltage hookup (120-240 V) with no manual linking, providing convenience in any job setting. Ideal solution for dirty or unreliable power. Low OCV stick is a simple design that reduces the open circuit voltage to 12-16 volts when the welding power source is not in use. This circuit design is now built into the Maxstar 161 S eliminating the need for add-on voltage reducers. Does this machine do aluminum? Maxstar 161 STL TIG/Stick Welder Package 907710001 an stick weld aluminum. It can not tig weld aluminum. Miller advises that the Maxstar 161 STL TIG/Stick Welder Package 907710001 will run off of a Bluestar 185. Maxstar 161 STL TIG/Stick Welder Package 907710001 can be enabled to initiate arc start through the foot pedal, this has to be done through the menu on machine. The machine can not tig aluminum because it has only dc weld output. For aluminum you need ac output with high frequency. Does this come with a foot pedal or thumb control for the rig set up? Maxstar 161 STL TIG/Stick Welder Package 907710001 does not come with a remote. The Maxstar 161 STL TIG/Stick Welder Package 907710001 cannot TIG weld Aluminum- but it CAN TIG weld Stainless Steel. Hi. I just like to ask if this one needs a generator or you can hook it up in your house. The Maxstar 161 STL TIG/Stick Package has a 120/240 Multi-voltage plug that can be run off of a standard house outlet or a 240 V plug in your garage/shop. So far, this unit has blown me away with it's capabilities, but maybe I'm easily impressed, hehe. So far I am really impressed with this unit, goes beyond what I was expecting, Very intuitive system! Product was a great price and with fast shipping made it that much better. For small projects the welder was worked perfect and the portability is very useful. This machine is super useful for small and medium projects in locations I can't get a bigger machine.